LOS ANGELES, Calif. /California Newswire/ — Children’s Digestive Health & Nutrition Foundation (CDHNF) and Starlight Children’s Foundation announced the launch of “IBDU: Graduating to Independence” (www.ibdu.org) – a new resource for young adults with Inflammatory Bowel Disease (IBD) who are preparing for college, vocational training, entrance into the workforce or living independently. The site provides answers for older teens and young adults to real life challenges and educational resources. IBD is a complex disease, especially in the pediatric population. Although at risk of essentially every complication of IBD that adults face, children with IBD are also faced with a number of unique issues. Additionally, there are unique social aspects of IBD that are especially problematic for older teens, college bound patients and young adults who are about to transition to independent living. The website includes a multitude of interactive features such as group discussions in the community, polls, and coming soon will be video stories related to IBD and coping skills. – Tips for becoming an advocate for their health, learning to ask questions, being assertive and taking responsibility. IBDU is a complementary program to Starlight’s UC and Crohn’s (www.ucandcrohns.org) online program. Developed as a joint effort of Starlight and the Crohn’s and Colitis Foundation of America, ucandcrohns.org connects teens from coast to coast who have ulcerative colitis or Crohn’s disease and provides them with helpful stories, video clips and tools. 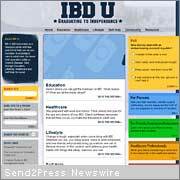 IBDU is a natural extension of the UC and Crohn’s website for teens nearing the end of high school and also provides valuable information for professors, employers and parents. Support for the IBDU website was provided by an unrestricted education grant from UCB, Inc. The Children’s Digestive Health and Nutrition Foundation was established in 1998 by the North American Society for Pediatric Gastroenterology, Hepatology and Nutrition (NASPGHAN) which represents 1500 pediatric gastroenterologists in the U.S., Canada and Mexico. CDHNF along with NASPHGAN, are the leading physician source of information on pediatric gastrointestinal, liver and nutritional issues. CDHNF is dedicated to improving the care of infants, children and adolescents with digestive disorders by promoting advances in clinical care, research and education. In addition to the pediatric IBD education campaign, CDHNF also provides resources on pediatric eosinophilic esophagitis, reflux and GERD and celiac disease. Additional information on CDHNF and NASPGHAN can be found at www.cdhnf.org and www.naspghan.org. When a child or teenager has a serious medical condition, everyone in the family is affected. For 25 years, Starlight Children’s Foundation has been dedicated to helping seriously ill children and their families cope with their pain, fear and isolation through entertainment, education and family activities. Starlight’s programs have been proven to distract children from their pain, help them better understand and manage their illnesses, and connect families facing similar challenges so that no one feels alone. Through a network of chapters and offices, Starlight provides ongoing support to children, parents and siblings in all U.S. states and Canadian provinces with an array of outpatient, hospital-based and Web offerings. Programs are also delivered internationally through affiliates in Australia, Japan and the United Kingdom. To learn more visit www.starlight.org.